The El Segundo Herald, a small town newspaper in Southern California, misreported the City’s $6.3 million annual property tax revenue as “about $1 million”. A correction is in order. Given that gross understatement of property tax revenue, voters may vote for Measure A, a massive tax hike on the April 8, 2014 City election ballot that will cost residents and businesses an estimated $6.6 million each year in its first three years. All residents will pay the business taxes that are passed on to them as customers. That is a strange mistake, given my statements during Public Communications at the March 4, 2014 Council meeting that El Segundo property tax revenue for fiscal year 2012/13 was at a record high of $6.3 million, and that I posted an article with a bar chart showing El Segundo property tax revenue going back to fiscal year 2000/01 at PublicSafetyProject.org, in the article titled, Wrong Time to Raise Taxes and Fees in El Segundo. That article includes a table with the revenue data used to create the bar chart, and a link to the City Hall document from which the data was obtained. Updated and expanded March 6, 2014. This is the wrong time to raise taxes and fees on residents and businesses in El Segundo, for multiple reasons. First, the existing three-year City employee union contracts are expiring later this year, and the City Council will negotiate new union contracts later this year after the April 8, 2014 City election. Raising taxes and fees before then will greatly weaken the City Council’s bargaining position with the unions, especially the politically active and extremely aggressive firefighter and police unions, which are the primary cause of the City’s financial problems. Second, Mayor Bill Fisher and Councilmembers David Atkinson and Marie Fellhauer have claimed that the City’s financial problems are largely due to El Segundo receiving a lower percentage of the property taxes generated from property in the City than other cities in California receive. That claim is false for multiple reasons. The percentage of total property tax revenue generated in El Segundo that the City receives has not changed in many years, and the last time it changed, it went up due to the extraordinary efforts of Mayor Carl Jacobson. In fact, although El Segundo gets about 6.2% of the property tax revenues generated by property in the city, compared to the average of 11% for all 88 cities in Los Angeles County, El Segundo property values are much higher than the values in many other cities. The higher property values in El Segundo help compensate for the lower than average percent of property tax revenue allocated to the City of El Segundo. 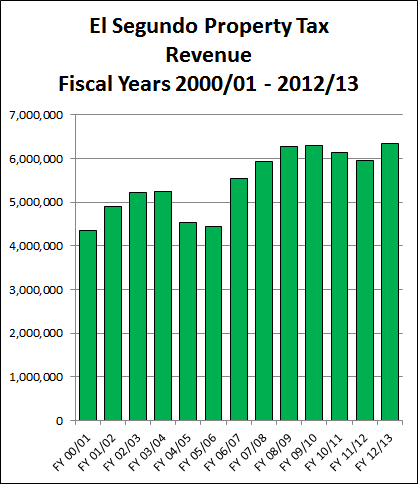 But most striking is the fact that the City is receiving the highest amount of property tax revenues it has received in any year since fiscal year 2000/2001, and probably in the City’s entire history, as shown by the bar chart below. The FY 2012/2013 property tax revenue is at a record high of $6,332,163 – up by 46% and $1,994,509 above FY 2000/2001 property tax revenue. Property tax revenue has increased in 9 of the last 13 fiscal years, with an average yearly increase of 3.6% and $166,209.